Neuroscience is an interdisciplinary field in science that is organized around the study of the nervous system. 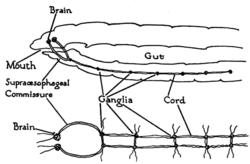 As such, the field encompasses the scientific study of the structure, function, and development of nervous systems, normal and abnormal variants, ranging from the simple systems of such invertebrates as platyhelminthes and nematodes to the complex systems of vertebrates like human beings, as well as including treatment of disorders and diseases of the nervous system. Among the components that are studied are the brain, dorsal and ventral nerve cords, spinal cord, nerves, muscles, neurons (nerve cells), central nervous system, peripheral nervous system, neurotransmitters, sense organs and senses (such as taste and touch), and so forth. As an interdisciplinary field, interconnections are made with such disciplines as biology, chemistry, physics, computer science, mathematics, engineering, linguistics, medicine, and psychology. There are many sub-disciplines within the field of neuroscience, including such major branches as neurology, affective neuroscience, molecular and cellular neuroscience, evolutionary neuroscience, cognitive and behavioral neuroscience, computational neuroscience, neuropsychology, and so forth. The term neurology was once used more generally for the study of the nervous system but now refers to the medical specialty dealing with disorders and diseases of the nervous system, including Alzheimer's disease, seizures, paralysis, coma, Parkinson's disease, hearing loss, meningitis, encephalitis, migraine, stroke, Lou Gehrig's disease, multiple sclerosis, and the nature of pain. Ultimately neuroscientists would like to understand every aspect of the nervous system, including how it works, how it develops, how it malfunctions, and how it can be altered or repaired. In particular, the human brain is the most complex known living structure, with some 86 billion nerve cells and trillions of neuronal connections; millions of information transfer processes take place in remarkable coordination every second in the human central and peripheral nervous system. There also are more than 1,000 disorders of the human brain and nervous system, with neurological disorders affecting up to one billion people worldwide. As the one species that can study itself, neurologists tackle such fundamental issues including the issue of consciousness itself. The specific topics that form the main foci of research change over time, driven by an ever-expanding base of knowledge and the availability of increasingly sophisticated technical methods. Over the long term, improvements in technology have been the primary drivers of progress. Developments in electron microscopy, computers, electronics, functional brain imaging, and most recently genetics and genomics, have all been major drivers of progress. The nervous system is the network of specialized cells, tissues, and organs in a multicellular animal that coordinates the body's interaction with the environment, including sensing internal and external stimuli, monitoring the organs, coordinating the activity of muscles, initiating actions, and regulating behavior. All parts of the nervous system are made of nervous tissue, which conducts electrical impulses. Nervous tissue is prominent in almost every major animal phylum, including platyhelminthes and nematodes. However, it is most complex in vertebrate animals. Flatworms (phylum Platyhelminthes) are the simplest bilateral animals and they have a bilateral nervous system with two cord-like nerves branching repeatedly in an array resembling a ladder. (Nervous tissue is notably lacking in Porifera, while the Ctenophora and Cnidaria—Radiata—have a relatively unstructured nervous system that is a diffuse nerve net rather than a central nervous system.) Nematodes (roundworms, phylum Nematoda) have a simple nervous system as well, with a main nerve cord running along the ventral side (the "belly" side). In annelids (segmented worms, phylum Annelida), the nervous system has a solid, ventral nerve cord from which lateral nerves arise in each segment. Every segment has an autonomy; however, they unite to perform as a single body for functions such as locomotion. Arthropods, such as insects and crustaceans, have a nervous system made up of a series of ganglia, connected by a ventral nerve cord which is made up of two parallel connectives running along the length of the belly. Many arthropods have well-developed sensory organs. 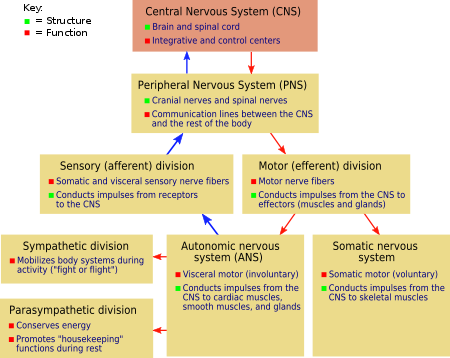 The nervous system of vertebrate animals is often divided into the central nervous system (CNS) and the peripheral nervous system (PNS), with the CNS comprising the brain and spinal cord, and the PNS comprising all other nerves and neurons that do not lie within the CNS. 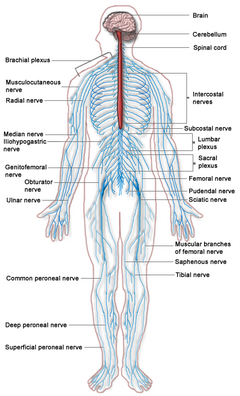 The peripheral nervous system is divided further into the somatic nervous system and the autonomic nervous system. In many species—including all vertebrates—the nervous system is the most complex organ system in the body, with most of the complexity residing in the brain. The human brain alone has been found to average about 86 billion neurons (Gonzalez 2012) and one hundred trillion synapses; it consists of thousands of distinguishable substructures, connected to each other in synaptic networks whose intricacies have only begun to be unraveled. In the human body, there are millions of information transfer processes occurring every second among trillions of neuronal interconnections in the central and peripheral nervous systems, exhibiting remarkable complexity and efficiency (Hollar 2008). The majority of the approximately 20–25,000 genes belonging to the human genome are expressed specifically in the brain. Due to the plasticity of the human brain, the structure of its synapses and their resulting functions change throughout life (HHS 2011). Thus, the challenge of making sense of all this complexity is formidable. Neuroscience is the study of the nervous system and also encompasses the treatment of disorders and diseases of the nervous system. Traditionally seen as a branch of biology, neuroscience currently is considered an interdisciplinary science that collaborates with such fields as chemistry, computer science, engineering, linguistics, mathematics, medicine and allied disciplines, philosophy, physics, and psychology. It also exerts influence on other fields, such as neuroeducation (Zull 2002) and neurolaw. The term neurobiology usually is used interchangeably with the term neuroscience, although the former refers specifically to the biology of the nervous system, whereas the latter refers to the entire science of the nervous system. The term neurology was once used in a synonymous way with the current definition of neuroscience. For example, MaGill's Medical Guide (2008) defines neurology as "the study of the nervous system" and "the study of the structure and function of the nervous system" (Hollar 2008). Indeed, the term neurology comes from the Greek νεῦρον, neuron, for "nerve cell" and the suffix -λογία for "study of." However, today neurology is limited to the medical specialty dealing with disorders and diseases of the nervous system. Included in this field is the study of such neurological disorders as Alzheimer's disease, seizures, paralysis, coma, meningitis, encephalitis, herpes simple virus 2, amnesia, Parkinson's disease, paraplegia, and hearing loss. The scope of neuroscience has broadened to include different approaches used to study the molecular, cellular, developmental, structural, functional, evolutionary, computational, and medical aspects of the nervous system. The techniques used by neuroscientists have also expanded enormously, from molecular and cellular studies of individual nerve cells to imaging of sensory and motor tasks in the brain. Recent theoretical advances in neuroscience have also been aided by the study of neural networks. Because of the increasing number of scientists who study the nervous system, several prominent neuroscience organizations have been formed to provide a forum to all neuroscientists and educators. For example, the International Brain Research Organization was founded in 1961 (IBRO 2013), the International Society for Neurochemistry in 1963 (ISN 2013), the European Brain and Behaviour Society in 1968 (EBBS 2009), and the Society for Neuroscience in 1969 (SFN 2013). The following are some of the major branches into which modern neuroscience education, research, and clinical activities can be very roughly categorized. Additional fields can be delineated and also individual neuroscientists often work on questions that span several distinct subfields. Affective neuroscience Affective neuroscience is the study of the neural mechanisms involved in emotion, typically through experimentation on animal models (Panksepp 1990). Behavioral neuroscience Behavioral neuroscience (also known as biological psychology, biopsychology, or psychobiology) is the application of the principles of biology to the study of genetic, physiological, and developmental mechanisms of behavior in humans and non-human animals. Cellular neuroscience Cellular neuroscience is the study of neurons at a cellular level including morphology and physiological properties. Clinical neuroscience This consists of medical specialties such as neurology and psychiatry, as well as many allied health professions such as speech-language pathology. Neurology is the medical specialty that works with disorders of the nervous system. Psychiatry is the medical specialty that works with the disorders of the mind—which include various affective, behavioral, cognitive, and perceptual disorders. 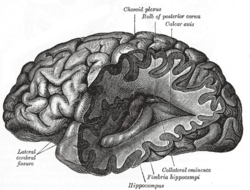 Cognitive neuroscience Cognitive neuroscience is the study of biological and neuropsychological substrates underlying cognition with a specific focus on the neural substrates of mental processes. Computational neuroscience Computational neuroscience is the study of brain function in terms of the information-processing properties of the structures that make up the nervous system. Computational neuroscience can also refer to the use of computer simulations and theoretical models to study the function of the nervous system. Cultural neuroscience Cultural neuroscience is the study of how cultural values, practices and beliefs shape and are shaped by the mind, brain and genes across multiple timescales (Chiao and Ambady 2007). Developmental neuroscience Developmental neuroscience studies the processes that generate, shape, and reshape the nervous system and seeks to describe the cellular basis of neural development to address underlying mechanisms. Evolutionary neuroscience Evolutionary neuroscience is an interdisciplinary scientific research field that studies the evolution of nervous systems. Molecular neuroscience Molecular neuroscience is a branch of neuroscience that examines the biology of the nervous system with molecular biology, molecular genetics, protein chemistry, and related methodologies. Neuroengineering Neuroengineering is a discipline within biomedical engineering that uses engineering techniques to understand, repair, replace, or enhance neural systems. Neuroethology Neuroethology is an interdisciplinary branch that studies the neural basis of natural animal behavior. Neuroheuristics Neuroheuristics (or Neuristics) is a transdisciplinary paradigm that studies the information processing effected by the brain as an outcome of nurture versus nature, at the crossing of top-down and bottom-up strategies. Neuroimaging Neuroimaging includes the use of various techniques to either directly or indirectly image the structure and function of the brain. Neuroinformatics Neuroinformatics is a discipline within bioinformatics that conducts the organization of neuroscience data and application of computational models and analytical tools. Neurolinguistics Neurolinguistics is the study of the neural mechanisms in the human brain that control the comprehension, production, and acquisition of language. Neurophysiology Neurophysiology is the study of the functioning of the nervous system, generally using physiological techniques that include measurement and stimulation with electrodes or optically with ion- or voltage-sensitive dyes or light-sensitive channels. Neuropsychology Neuropsychology is a discipline that resides under the umbrellas of both psychology and neuroscience, and is involved in activities in the arenas of both basic science and applied science. In psychology, it is most closely associated with biopsychology, clinical psychology, cognitive psychology, and developmental psychology. In neuroscience, it is most closely associated with the cognitive, behavioral, social, and affective neuroscience areas. In the applied and medical domain, it is related to neurology and psychiatry. Paleoneurology Paleoneurology is a field which combines techniques used in paleontology and archeology to study brain evolution, especially that of the human brain. Social neuroscience Social neuroscience is an interdisciplinary field devoted to understanding how biological systems implement social processes and behavior, and to using biological concepts and methods to inform and refine theories of social processes and behavior. Systems neuroscience Systems neuroscience is the study of the function of neural circuits and systems. The study of the nervous system can be done at multiple levels, ranging from the molecular and cellular levels to the systems and cognitive levels. At the molecular level, the basic questions addressed in molecular neuroscience include the mechanisms by which neurons express and respond to molecular signals and how axons form complex connectivity patterns. At this level, tools from molecular biology and genetics are used to understand how neurons develop and how genetic changes affect biological functions. The morphology, molecular identity, and physiological characteristics of neurons and how they relate to different types of behavior are also of considerable interest. The fundamental questions addressed in cellular neuroscience include the mechanisms of how neurons process signals physiologically and electrochemically. These questions include how signals are processed by neurites—thin extensions from a neuronal cell body, consisting of dendrites and axons—and somas (the cell bodies of the neurons containing the nucleus), and how neurotransmitters and electrical signals are used to process information in a neuron. Another major area of neuroscience is directed at investigations of the development of the nervous system. These questions include the patterning and regionalization of the nervous system, neural stem cells, differentiation of neurons and glia, neuronal migration, axonal and dendritic development, trophic interactions, and synapse formation. At the systems level, the questions addressed in systems neuroscience include how neural circuits are formed and used anatomically and physiologically to produce functions such as reflexes, sensory integration, motor coordination, circadian rhythms, emotional responses, learning, and memory. In other words, they address how these neural circuits function and the mechanisms through which behaviors are generated. For example, systems level analysis addresses questions concerning specific sensory and motor modalities: how does vision work? How do songbirds learn new songs and bats localize with ultrasound? How does the somatosensory system process tactile information? The related fields of neuroethology and neuropsychology address the question of how neural substrates underlie specific animal and human behaviors. Neuroendocrinology and psychoneuroimmunology examine interactions between the nervous system and the endocrine and immune systems, respectively. Despite many advancements, the way networks of neurons produce complex cognitions and behaviors is still poorly understood. At the cognitive level, cognitive neuroscience addresses the questions of how psychological functions are produced by neural circuitry. The emergence of powerful new measurement techniques such as neuroimaging (e.g., fMRI, PET, SPECT), electrophysiology, and human genetic analysis combined with sophisticated experimental techniques from cognitive psychology allows neuroscientists and psychologists to address abstract questions such as how human cognition and emotion are mapped to specific neural substrates. Neuroscience is also allied with the social and behavioral sciences as well as nascent interdisciplinary fields such as neuroeconomics, decision theory, and social neuroscience to address complex questions about interactions of the brain with its environment. Evidence for the surgical practice of either drilling or scraping a hole into the human skull (trepanation, likely as attempted treatments for mental disorders, headaches, or relieving cranial pressure, has been traced back to Neolithic times and has been found in various cultures throughout the world. The Edwin Smith Papyrus, or Edwin Smith Surgical Papyrus, is a preserved medical document from ancient Egypt that is a classic in neurosurgery. It traces to about the sixteenth to seventeenth century B.C.E. but actually is the only surviving copy of part of a much older treatise from about 3000 to 2500 B.C.E. It contains the first known descriptions of the cranial sutures, the meninges, the external surface of the brain, the cerebrospinal fluid, and the intracranial pulsations (Wilkins 1964). It provided evidence the ancient Egyptians had some knowledge about symptoms of brain damage (Mohamed 2008), and advised immobilization for head and spinal cord injuries, which is still in practice today in the short-term treatment of some injuries. It describes results from cervical vertebral dislocation (Wilkins 1964). In Egypt from the late Middle Kingdom onwards, the brain sometimes was viewed as some sort of "cranial stuffing" and was regularly removed in preparation for mummification. It was believed at the time that the heart was the seat of intelligence. According to Herodotus, the first step of mummification was to "take a crooked piece of iron, and with it draw out the brain through the nostrils, thus getting rid of a portion, while the skull is cleared of the rest by rinsing with drugs" (Herodotus 440 B.C.E.). The view that the heart was the source of consciousness was not challenged until the time of the Greek physician Hippocrates. He believed that the brain was not only involved with sensation—since most specialized organs (e.g., eyes, ears, tongue) are located in the head near the brain—but was also the seat of intelligence. Plato also speculated that the brain was the seat of the rational part of the soul (Plato 360 B.C.E.). Aristotle, however, believed the heart was the center of intelligence and that the brain regulated the amount of heat from the heart (Finger 2001). This view was generally accepted until the Roman physician Galen, a follower of Hippocrates and physician to Roman gladiators, observed that his patients lost their mental faculties when they had sustained damage to their brains. Abulcasis, Averroes, Avenzoar, and Maimonides, active in the Medieval Muslim world, described a number of medical problems related to the brain. In Renaissance Europe, Vesalius (1514–1564) and René Descartes (1596–1650) also made several contributions to neuroscience. 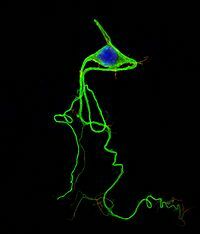 The Golgi stain first allowed for the visualization of individual neurons. Studies of the brain became more sophisticated after the invention of the microscope and the development of a staining procedure by Camillo Golgi during the late 1890s. The procedure used a silver chromate salt to reveal the intricate structures of individual neurons. 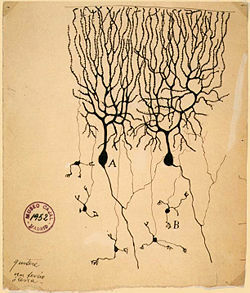 His technique was used by Santiago Ramón y Cajal and led to the formation of the neuron doctrine, the hypothesis that the functional unit of the brain is the neuron. Golgi and Ramón y Cajal shared the Nobel Prize in Physiology or Medicine in 1906 for their extensive observations, descriptions, and categorizations of neurons throughout the brain. While Luigi Galvani's pioneering work in the late 1700s had set the stage for studying the electrical excitability of muscles and neurons, it was in the late 19th century that Emil du Bois-Reymond, Johannes Peter Müller, and Hermann von Helmholtz demonstrated that the electrical excitation of neurons predictably affected the electrical states of adjacent neurons. In parallel with this research, work with brain-damaged patients by Paul Broca suggested that certain regions of the brain were responsible for certain functions. At the time, Broca's findings were seen as a confirmation of Franz Joseph Gall's theory that language was localized and that certain psychological functions were localized in specific areas of the cerebral cortex (Greenblatt 1995; Bear et al. 2001). The localization of function hypothesis was supported by observations of epileptic patients conducted by John Hughlings Jackson, who correctly inferred the organization of the motor cortex by watching the progression of seizures through the body. Carl Wernicke further developed the theory of the specialization of specific brain structures in language comprehension and production. Modern research still uses the Brodmann cerebral cytoarchitectonic map (referring to study of cell structure) anatomical definitions from this era in continuing to show that distinct areas of the cortex are activated in the execution of specific tasks (Kandel et al. 2000). In 1952, Alan Lloyd Hodgkin and Andrew Huxley presented a mathematical model for transmission of electrical signals in neurons of the giant axon of a squid, action potentials, and how they are initiated and propagated, known as the Hodgkin-Huxley model. In 1961-2, Richard FitzHugh and J. Nagumo simplified Hodgkin-Huxley, in what is called the FitzHugh–Nagumo model. In 1962, Bernard Katz modeled neurotransmission across the space between neurons known as synapses. In 1981 Catherine Morris and Harold Lecar combined these models in the Morris-Lecar model. In 1984, J. L. Hindmarsh and R. M. Rose further modeled neurotransmission. Beginning in 1966, Eric Kandel and collaborators examined biochemical changes in neurons associated with learning and memory storage. The scientific study of the nervous system has increased significantly during the second half of the twentieth century, principally due to advances in molecular biology, electrophysiology, and computational neuroscience. This has allowed neuroscientists to study the nervous system in all its aspects: how it is structured, how it works, how it develops, how it malfunctions, and how it can be changed. For example, it has become possible to understand, in much detail, the complex processes occurring within a single neuron. Neurology, psychiatry, neurosurgery, psychosurgery, anesthesiology, neuropathology, neuroradiology, clinical neurophysiology, and addiction medicine are medical specialties that specifically address diseases of the nervous system. These terms also refer to clinical disciplines involving diagnosis and treatment of these diseases. Neurology address diseases and disorders of the central and peripheral nervous systems, such as amyotrophic lateral sclerosis (ALS) and stroke, and their medical treatment. Psychiatry focuses on affective, behavioral, cognitive, and perceptual disorders. Anesthesiology focuses on perception of pain, and pharmacologic alteration of consciousness. Neuropathology focuses upon the classification and underlying pathogenic mechanisms of central and peripheral nervous system and muscle diseases, with an emphasis on morphologic, microscopic, and chemically observable alterations. Neurosurgery and psychosurgery work primarily with surgical treatment of diseases of the central and peripheral nervous systems. The boundaries between these specialties have been blurring recently as they are all influenced by basic research in neuroscience. Brain imaging also enables objective, biological insights into mental illness, which can lead to faster diagnosis, more accurate prognosis, and help assess patient progress over time. The largest professional neuroscience organization is the Society for Neuroscience (SFN), which is based in the United States but includes many members from other countries. Since its founding in 1969 the SFN has grown steadily: as of 2013 it has around 42,000 members from 90 different countries (SFN 2013). Other major organizations devoted to neuroscience include the International Brain Research Organization (IBRO) and the Federation of European Neuroscience Societies (FENS). FENS comprises a set of 32 national-level organizations, including the British Neuroscience Association, the German Neuroscience Society (Neurowissenschaftliche Gesellschaft), and the French Société des Neurosciences. The Molecular and Cellular Cognition Society is an international neuroscience society with courses and meetings in North America, Europe and Asia, and with more than 5000 members world-wide. Bear, M. F., B. W. Connors, and M. A. Paradiso. 2001. Neuroscience: Exploring the Brain, 2nd edition. Philadelphia: Lippincott Williams & Wilkins. ISBN 0781739446. Chiao, J. Y., and N. Ambady. 2007. Cultural neuroscience: Parsing universality and diversity across levels of analysis. Pages 237-254 in S. Kitayama and D. Cohen (Eds. ), Handbook of Cultural Psychology. New York: Guilford Press. Finger, S. 2001. Origins of Neuroscience: A History of Explorations into Brain Function, 3rd edition. New York: Oxford University Press. ISBN 0195146948. Greenblatt, S. H. 1995. Phrenology in the science and culture of the 19th century. Neurosurg 37, iss. 4: 790–805. PMID 8559310. Retrieved October 2, 2013. Herodotus. 440 B.C.E. The Histories: Book II (Euterpe) (translated by G. Rawlinson). Retrieved October 2, 2013.
International Society for Neurochemistry (ISN). 2013. Chapter 2: The Beginning. International Society for Neurochemistry. Retrieved October 2, 2013. Kandel, E. R., J. H. Schwartz, and T. M. Jessel. 2000. Principles of Neural Science, 4th edition. New York: McGraw-Hill. ISBN 0838577016. Panksepp, J. 1990. A role for "affective neuroscience" in understanding stress: The case of separation distress circuitry. In S. Puglisi-Allegra and A. Oliverio, Psychobiology of Stress. Dordrecht, Netherlands: Kluwer Academic. ISBN 0792306821. Plato. 360 B.C.E. Timaeus (translated by B. Jowett). Retrieved October 2, 2013. Society for Neuroscience (SFN). 2013. Mission and strategic plan. Society for Neuroscience. Retrieved October 2, 2013. Zull, J. 2002. The Art of Changing the Brain: Enriching the Practice of Teaching by Exploring the Biology of Learning. Sterling, VA: Stylus Publishing. ISBN: 1579220533. This page was last modified on 29 December 2014, at 17:19.